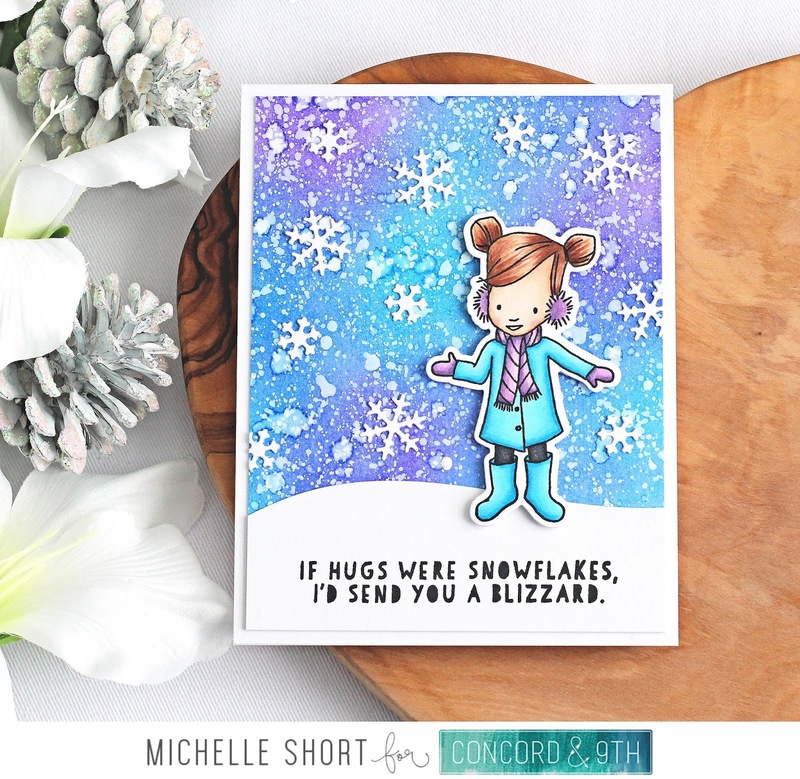 Hello there, today I am back with my third guest design post for Concord & 9th and today we are using the fabulous Bundled Up set. It is so cute! This is a fabulous set that you can either colour in or if you are not keen on colouring, or want a different look, you can stamp the different parts of the image with inks to add in the colour. I started off by stamping the girl outline on to white cardstock with Memento Tuxedo Black Ink. I coloured her with Copic Markers (the colours I used are listed below the supplies section) and added some Aqua Shimmer pen to her scarf. She was cut out using the coordinating dies and set aside. Next, I worked on the background. I took a panel of watercolour paper and blended on Distress Inks in Mermaid Lagoon, Blueprint Sketch and Wilted Violet. I then splatted over a solution of water and Perfect Pearls and then Copic Opaque White to create a blizzard type look. Once this piece was dry, it was cut down and added to an A2 white card base with tape runner. 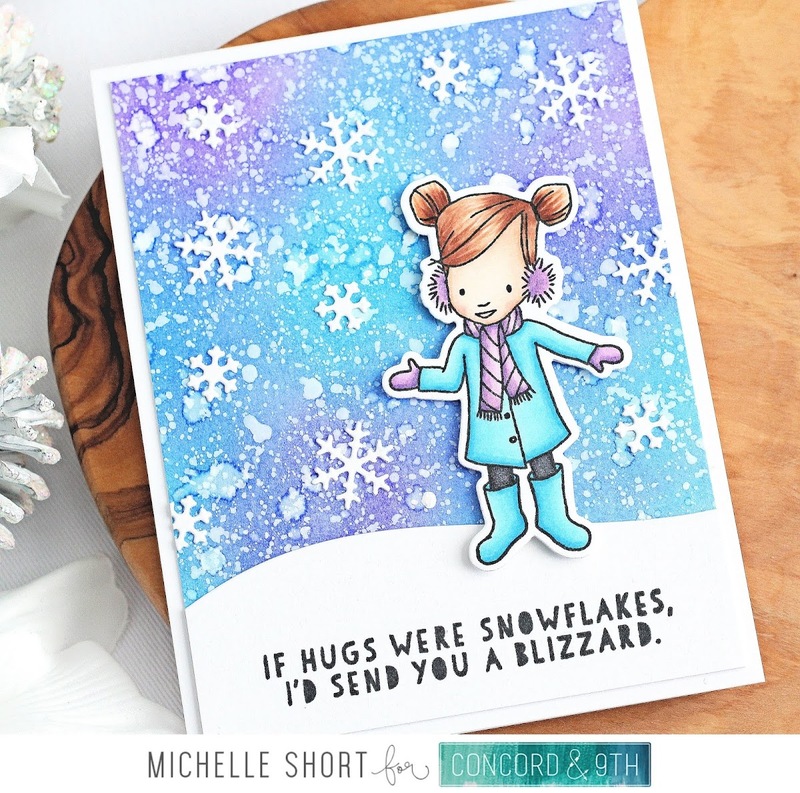 I took the snow bank die from the Bundled Up Die collection and cut this from white cardstock. I stamped the sentiment on top with black ink. 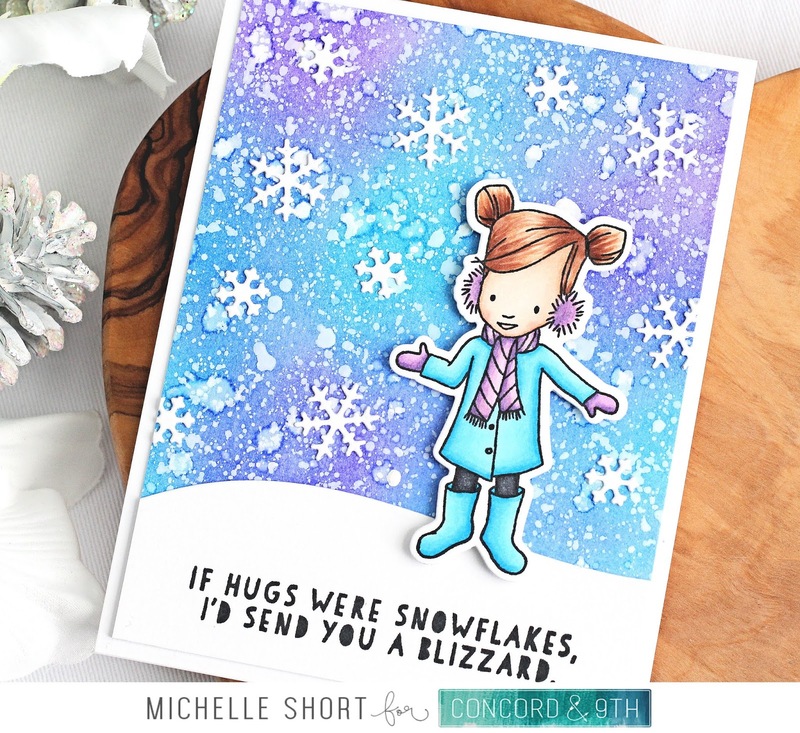 The snow bank was added flat to the card with tape runner and then the girl added on top with foam tape. I took the Wintry Edge Dies (which is a free gift when you spend over $60 in store at C9) and cut the snowflakes from white cardstock. These were then added to the card with liquid glue to finish off the scene. COPIC MARKERS: Girl's skin - E13, E11, E00, E000, E50, R20. Hair - E29, E27, E25, E23, E21. Coat and shoes - B06, B04, B02, B01. Gloves, scarf and ear muffs - V17, V15, V12. Trousers - C9, C8, C7. For more inspiration using this set, please head over to the Concord & 9th blog to see what my fellow guest designers have been up to. Concord & 9th are celebrating thanksgiving with a wonderful sale. This runs from today and ends on Tuesday. 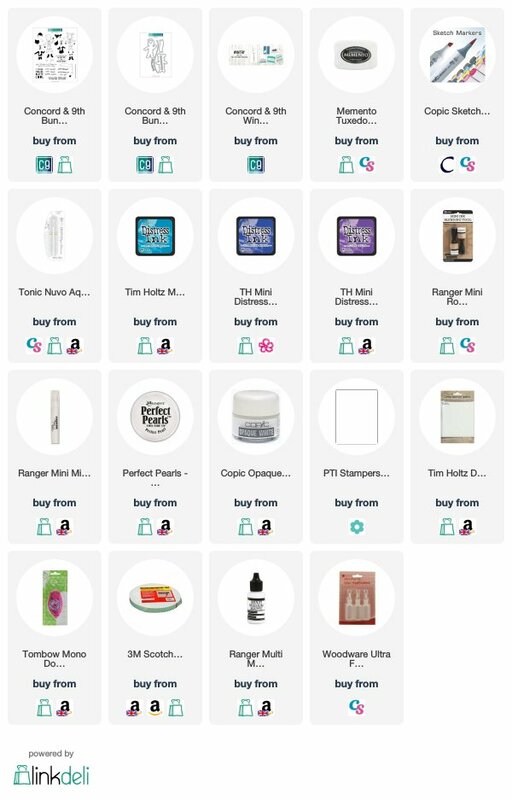 All products (except the new release) are 20% off and there are lots of other deals in the store which are between 40-70% off, too! Thank you so much for visiting me today. Have a great day and a wonderful weekend! So sweet! I love the background! !